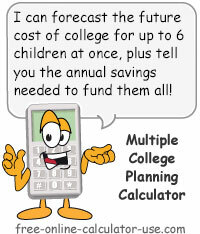 College Planning Calculator to Calculate a College Saving Plan For Any Number of Children. This calculator will help you to create a college saving plan that includes all of your children at one time. Simply enter the name, age, and estimated current annual college cost for each child, then enter your current savings, the percentage to be funded by outside sources, the rate of return, and the annual inflation rate. A chart showing the inflated annual cost for each child and the year they come due. A chart showing the year-by-year income and expense forecast. 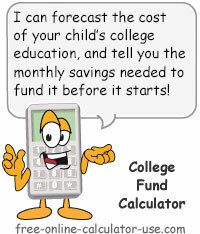 Note that if you would like to calculate a college saving plan for 1 child, please visit the College Funding Calculator -- which also includes an eye-opening article explaining why college financial planning involves more than just setting aside money. Two planning variables beyond your control. Calculate a college saving plan for any number of children, and one that accounts for the ever rising cost of post-secondary education. Note that depending on the width of the calculator, a vertical mobile entry form will be displayed for narrow widths, or a horizontal desktop entry form will be displayed for widths wide enough to accommodate it. To add a child, enter the child's name and current age, and then either enter your own estimate of annual college costs, or select the type of college from the menu. When you're satisfied with the entries, tap the &plus; button (may also appear as "Add" or "Add Child" depending on the width of your device). To edit a child in the list, tap the radio button in the Edit column. This will load the child's info into the form for editing. When you're satisfied with the changes you've made, tap the S button (may also appear as "Save" or "Save Changes" depending on the width of your device). To delete a child from the list, tap the radio button in the Edit column. This will load the child's info into the form for deleting. Tap the − button (may also appear as "Delete" depending on the width of your device). To clear the form to add another child, tap the C button (may also appear as "Clr" or "Clear" depending on the width of your device). To add a child, click the Add Child Row button, then enter the child's name and age, and either select the college type or enter the annual cost manually. To delete a child from the list, simply click the X button in the left-hand column. Important! 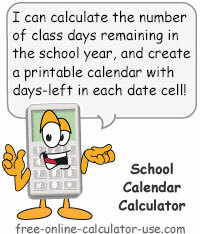 The entries are saved in your device's random memory (temporary storage), which means that if you surf to another calculator or close this browser window -- without saving the data record -- you will need to re-add your children. Enter a short name or nickname for the child. These will be column headings in the results, therefore please keep the nicknames to 10 letters or less. Enter the current age of the child. Note that the college planning calculator assumes each child will start college in the year they turn 18, so if you expect a child will start later than that, adjust their current age downward accordingly. If you want the college planning calculator to enter an estimated annual cost for you based on a recent college board survey, select the type of college from the pull-down menu. Otherwise, choose "Entering my own estimate" and enter your estimate in the next column. If entering your own cost estimate, enter the current annual cost of attending college based on which type of education you believe the child (and your financial situation) will be best suited for. Enter as a dollar amount but without the dollar sign and any commas. Note that if you enter your own estimate the calculator will assume a 4-year degree. If you want the college planning calculator to enter an estimated annual cost for you based on a recent college board survey, select the type of college from the pull-down menu. Otherwise, choose "Entering my own estimate" and enter your estimate on the next line. This section is for entering and selecting data that applies to any and all children entered. Total up your current college savings accounts and enter the total on this line. If you have no savings, simply leave the field blank. Enter a number from 0-100 that represents the percentage of the college costs you expect to be funded by outside sources (inheritance, grants, scholarships, work study, etc.). Enter as a percentage but without the percent sign (for .25 or 25%, enter 25). Select the average annual percentage you expect to earn on the money deposited to your college savings accounts. Select the average annual inflation rate you expect to see between now and when your youngest child finishes college (the annual increase in costs was 3.1% in 2017, 2.4% in 2016, 2.9% in 2015, 1% in 2014, 2.9% in 2013, 4.8% in 2012, and 8.5% in 2011, not adjusted for inflation). Note that this rate will be used to inflate the annual cost of college from now until all of your children finish college. Based on the entered current annual cost of attending college for each child, and on the selected annual inflation rate, this is how much it will cost to put all of your children through college. Based on the entered percentage, this is how much of the total cost you expect will be funded by outside sources. This is the total cost of putting all of your children through college, less the amount you estimate will come from outside funding sources. This is the amount you will need to deposit into your college saving funds at the beginning of each year in order to cover the expected savings shortfall. This is simply the annual contribution divided by 12 months. If this number is greater than zero it means that even though the annual contribution will eventually cover the entire cost of putting your children through college, at some point in the college savings plan you will need to subsidize a temporary negative balance (perhaps using a short-term student loan). In order to avoid an interim savings shortfall you will need to either increase the amount you currently have in the college savings account, or increase the percentage of funding from outside sources, or a combination of both. For each child, enter the name, age, college type, and annual cost, then tap the plus (+) button to add the child to your list. For each child, click the "Add Child Row" button and enter the name, age, college type, and annual cost. Enter the amount you currently have saved up for putting your children through college. Enter the percentage offset you expect to receive from outside funding sources. Select the percentage return you expect to earn on your college savings account. Select the annual inflation rate you expect to occur over the course of your college savings period. Tap the Calculate Saving Plan button and scroll down to view the results. Financial planning for college must be an ongoing process. Unfortunately fluctuations in these two dependent variables are impossible to predict with any certainty. Therefore all you can do when creating your initial college savings plan is to base your predictions on recent average college costs and savings rates (best guesses). After that you must continually revise your plan based on any unforeseeable changes in the dependent variables. If you are serious about successfully funding college educations for your children I recommend you bookmark this page so you can revisit the college planning calculator on an annual basis and revise your plan based on what actually happened versus what you had planned would happen. 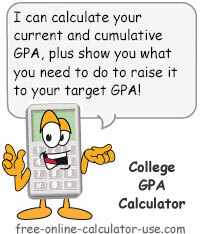 I will do my best to keep the calculator updated with the most recent average college costs.